Got a little bit more done over the last week. Managed to get the windshield, bow light, horn, cleats, and various other things mounted. I rewired the bow light and converted it to an LED. I had to rebuild the horn; I bought one of the cheap horns from Harbor Freight and pulled out the innards (diaphragm, actuator, etc. ), machined a piece of PVC to adapt it to fit the old horn housing, and then replaced the non-functional components. Everything else just needed a little bit of a cleaning and polishing before going back on. 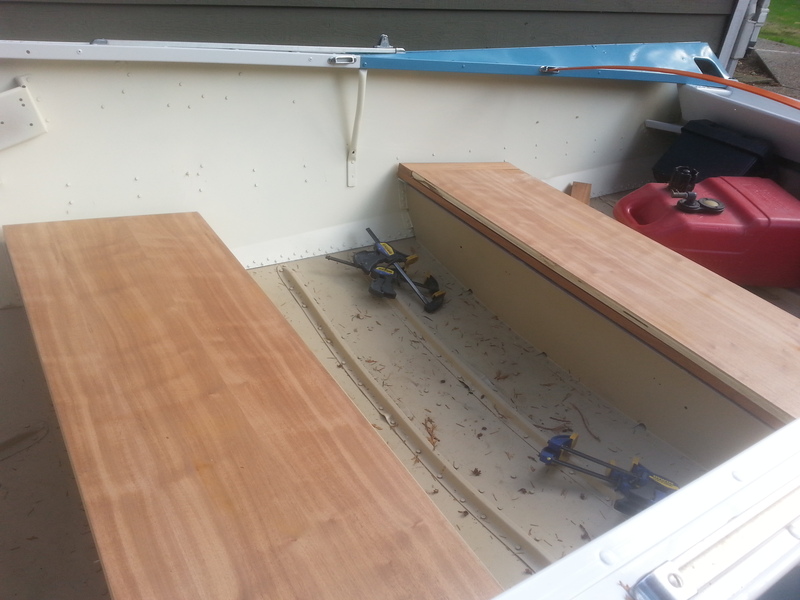 I also started fabricating the seat bench tops out of mahogany (solid and ply) that I will be mounting my seats to. I have to get them glued and screwed together, then stain and varnish, but it looks like the weather may not cooperate this weekend. I'm just torn between doing it the easy way and having visible fasteners (i.e. screw heads) holding those bench tops together or going the extra mile and putting them together with hidden fasteners. It would be easy to clamp them and glue and screw them in place, but then the screws would be visible. Alternately, I could pull them out and fasten them together from underneath so that you can't see the screws, but keeping the geometry correct out of the boat so that they go back in without an issue is going to be a lot trickier. I'm leaning towards getting some brass screws, so they're aesthetically pleasing, and going the easy route. Thanks, I just wish it was four months ago, but I guess it will be done for next boating season. Varnishing the seat tops and dash have been a very slow process with all the rain we've been getting; recommended dry times aren't so accurate when it's this cold and wet. I doubled them and still ran into soft varnish when I went to sand the first time and have since been waiting a full 24-hours between coats, but it's getting close. I got the dash completely varnished and have it installed along with all the electrical components, wiring, and pulley steering system. 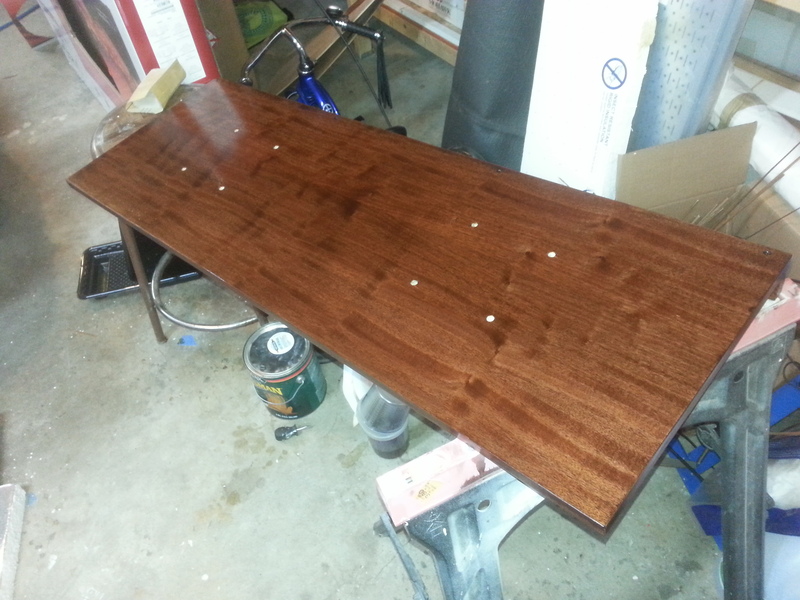 One side of the bench tops is finished and I've got 2 coats on the remaining side, but still have 3-4 more coats to go. Should have the seats mounted by the end of the week with any luck. Last edited by enginerd on 05 Nov 2016, 13:25, edited 1 time in total. very nice - very nice indeed !!! just remember, varnish does not last for years and years outside. it is a maintenance item. 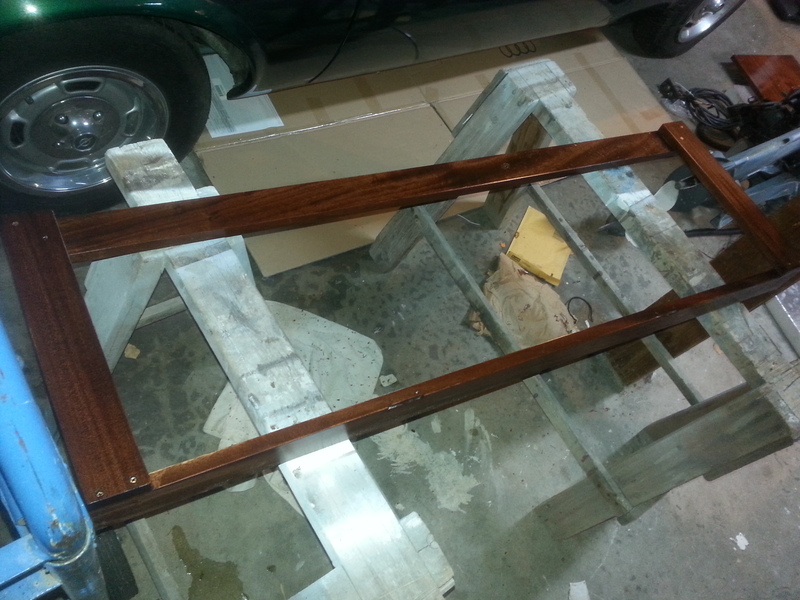 Strip it, sand it, and varnish it with a good quality traditional tung oil Spar varnish. 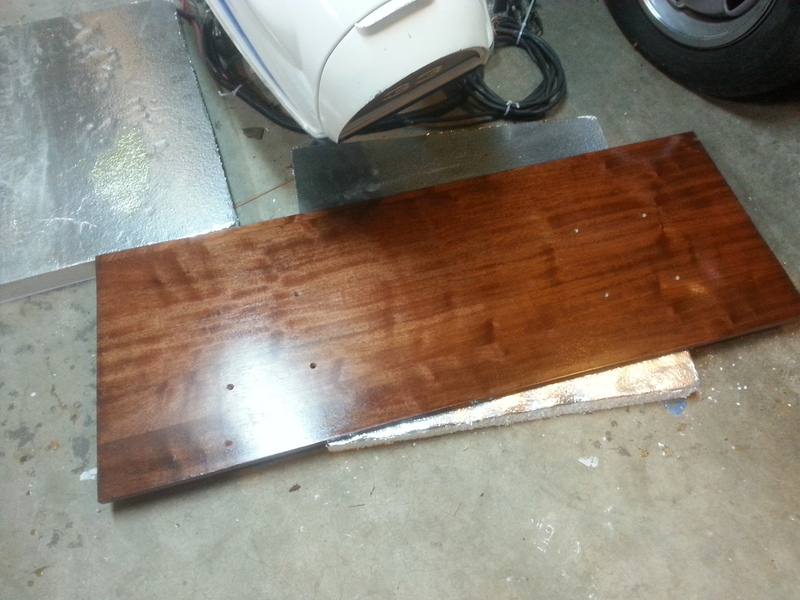 Start with 3 or 4 coats, 12-24 hours apart, no sanding in between. rub it down and put on another coat. Every boating season without fail. 20 years without having to replace any of the woodwork. you can re-coat something in a remarkably short time. It becomes routine and after a while, both easy and pleasant". 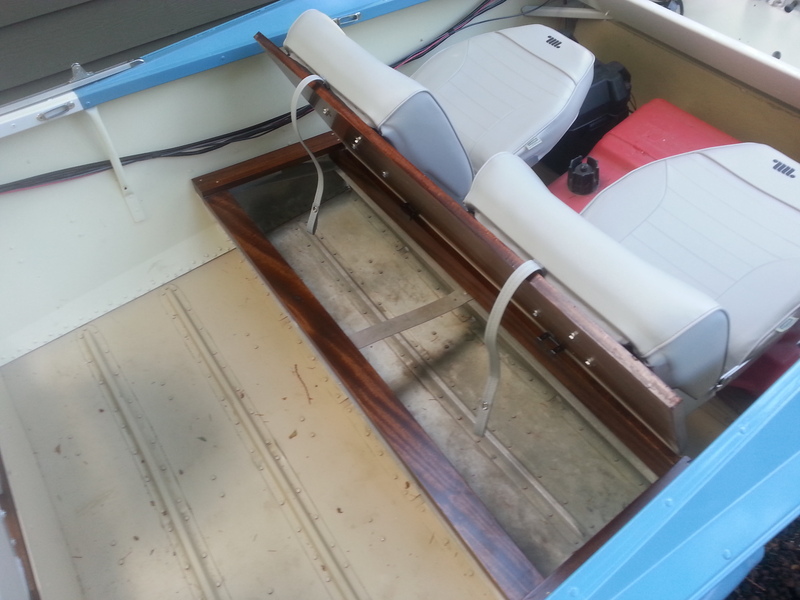 again, this all depends on how you use your boat and how it is stored when not in use. as far as your cold wet weather goes, that is what the kitchen table was made for !!!! or varnishing your woodwork. not for warm homecooked meals - nuke a frozen TV dinner and eat on the couch. if you google britework or brightwork you will find some pretty interesting reading. can' wait to see your project come together !!!! Thanks for the advice Johnny. I'm not a huge fan of the maintenance that goes with brightwork, but it seemed appropriate for this boat. I figure if I get sick of maintaining it I can always decide to replace it in the future. I am using Minwax Helmsman Spar Varnish and the can recommends three coats with 4-hour dry time in between, but I've been going with 5-6 coats total with a full 24-hours in between coats (sanded with 220-grit). I've been rolling it on with a foam roller (helps distribute varnish evenly) and then tipping it with a badger hair brush. I'm thinking that should provide a good base and I will probably take your advice to add a new coat this Spring as part of my season preparation. I tried selling my wife on the conversion of the kitchen table into a workbench, but she's not going for it. oh, I'm sorry - I didn't realize you had to ask permission for the table. (just kiddinggggggg). LOL HAHAHAHA LOL that's funny right there. with my clutter and hobby habits. on your woodwork - you have done great !! thanks for sharing your journey. Last edited by Johnny on 06 Nov 2016, 08:36, edited 1 time in total. Well, I don't have to ask permission, but things tend to work out better for me if I do. Thanks for the compliment; I'm by no means a finish carpenter, but I think they came out pretty well. Thanks Sonny. It's getting close to "finished," but I've learned that as long as I have a boat, I will always have a project or two that still needs doing. 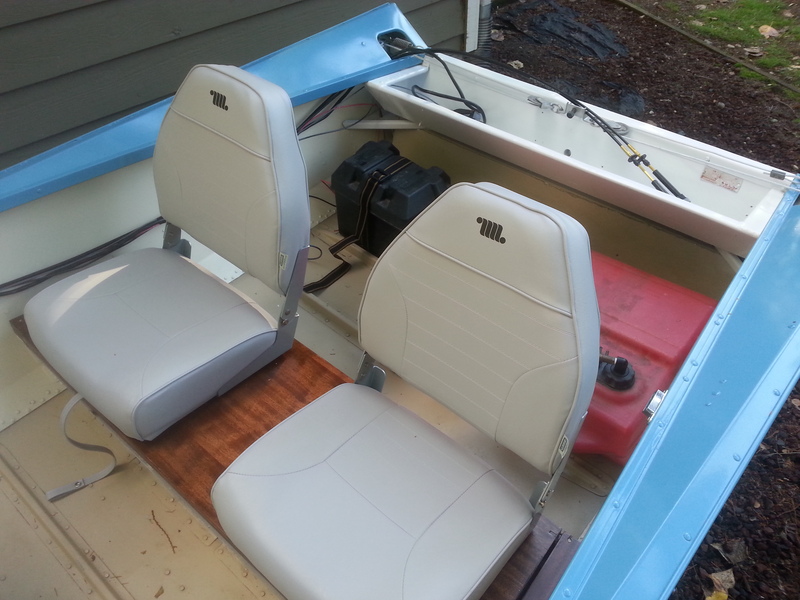 Well, I got the benches and seats installed, ran the wiring (engine, lights, horn, and 12-V plug), swapped out for new shift cables, temporarily installed the engine control box, and got the battery box installed. I will probably pull the control box to restore it. It came with the engine and, while it looks okay in the pictures, there's actually a lot of over-spray from the previous owner's attempt to repaint his console and other wear and tear. I will probably strip it down and repaint it. I've got a replacement Evinrude Simplex decal from American Outboard to replace the Johnson one and the plastic handles for the levers will get a clean up as well (my wife might let me do at least some of this project on the kitchen counter). I also still need to figure out a set-up for my stern light; maybe I can snag a period correct one on eBay; the one that was on it was clearly jury-rigged, so I don't know what the original set-up was like (Don't suppose you have any pictures of yours Johnny?). 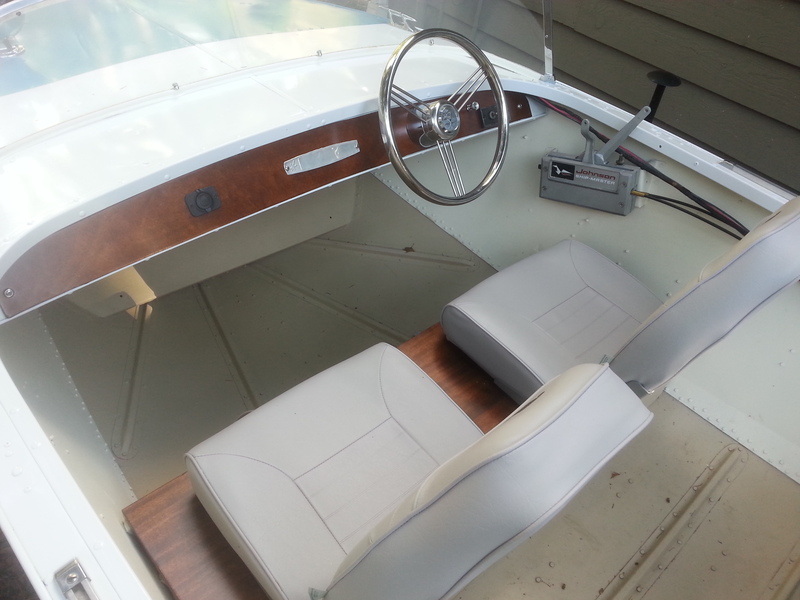 American Outboard is also looking into helping me recreate a decal to replace the graphic on the dash plate. Mine was sun bleached to bare aluminum when I got it, but someone over at the Lone Star yahoo group was nice enough to provide me with an image of his dash plate that was in slightly better condition. 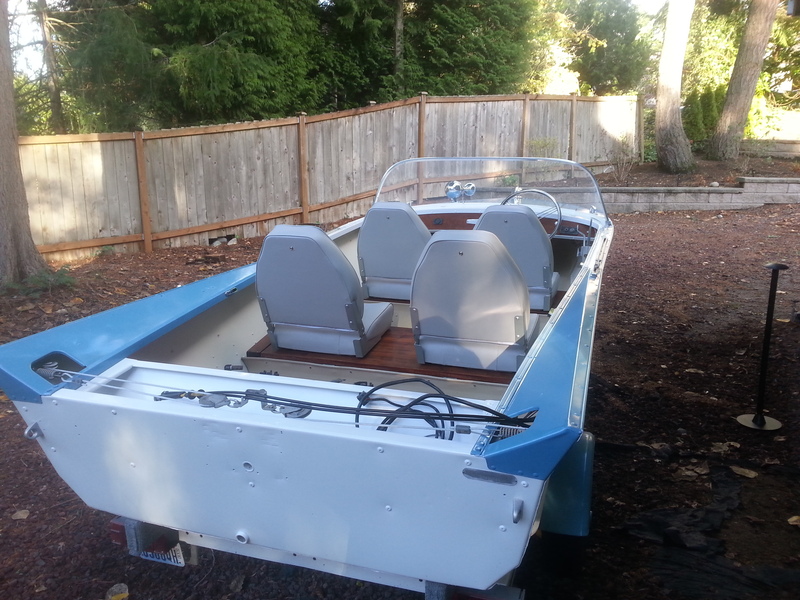 It's all coming together, but I will probably wait to mount the outboard until this Spring; I don't see much use in mounting it on the boat now just to have it sit outside for the winter. Then again, I'm impatient and might not be able to help myself from mounting it now. you have come a long way in your nautical refurbishment skills for sure. the period correct bow red/green nav light, horn and spotlight. I still need the bow handle. 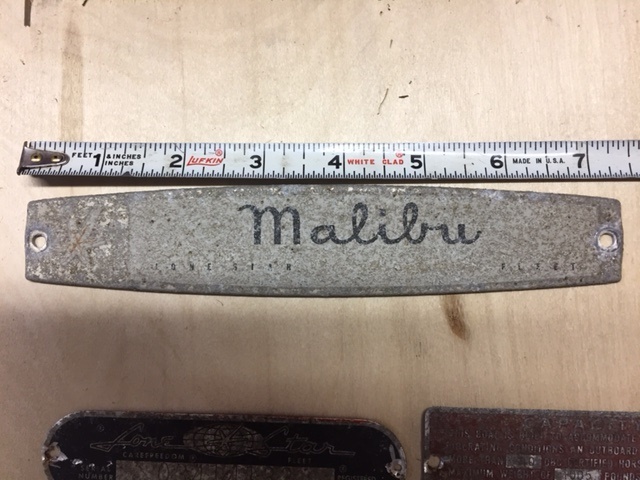 My Malibu tag that goes on the dash is like yours, not even readable. just from the cosmetics standpoint. and today, I scored a set of the large logo emblems that goes on the sides of the boat. it yet, but, I bet it ain't gonna be cheap !! I love the way you mounted your seats !!!! about the shift box. He shows a few nice examples of the vintage shift boxes. Thank you for sharing your journey with us !!!! Last edited by Johnny on 01 Dec 2016, 20:07, edited 1 time in total. Thanks for the compliment Johnny. 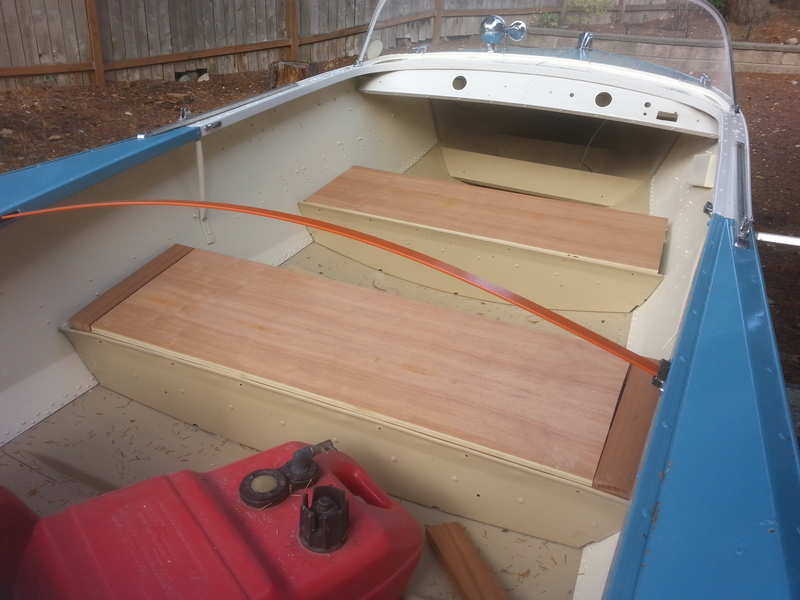 It's not my first boat build, but this is the restoration I've done and the first tin boat (unless you count a 65-ft aluminum houseboat). I think I will stick with tin in the future if I can help it; it's a lot less itchy than fiberglass. I'm thinking of a slightly bigger cabin cruiser like the Lone Star Cruise Master as a future project, if I can sell my wife on the idea. Yeah, with the fins, it's not really obvious how they mounted a stern light on these boats. There were some abandoned mounting holes in the lower corner brace on the starboard side, but that would mean that the stern light pole would need to come up through the hole with the steering and throttle cables. 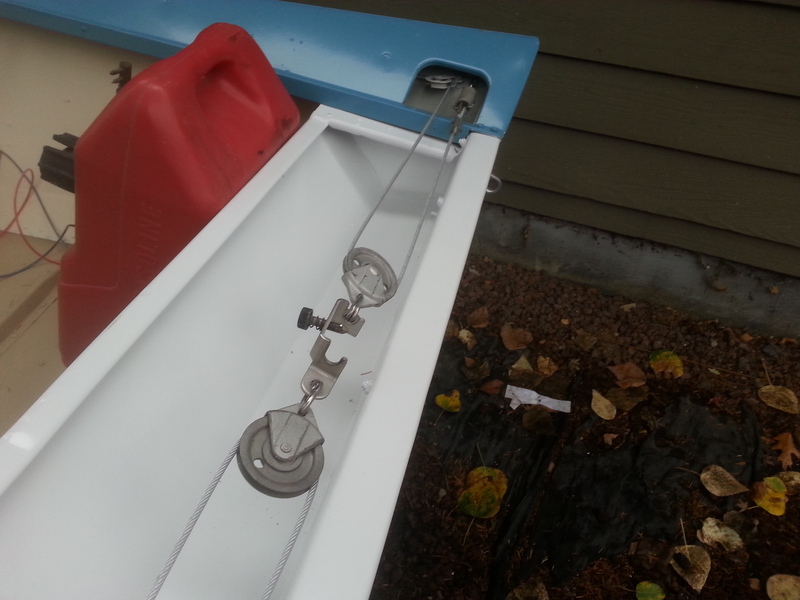 The one that was on the boat when I got it was attached to what was clearly a scrap piece of aluminum that was bolted to the side of the motor well and then just left the light mount dangling out in front of the motor well. I can get a mounting bracket that will fit on the small shelf on the side of the motor well, but would prefer to have something era appropriate. I don't intentionally do much night boating, but I like to be prepared. There have been a few times where I made it back to the launch ramp a little later than planned for various reasons. If you're not going to mount a permanent stern light, you can always carry one of these battery powered ones (https://www.amazon.com/Attwood-14180-7-Portable-Marine-Finish/dp/B01B3M2AE2/ref=pd_sbs_200_1). As for the original spot light, if you've got a picture I'd appreciate it. The one that was on my boat wasn't original and I decided against remounting it since it wasn't well supported and was kind of it the way of the driver's line of sight. If I could ever find an original or something slightly smaller that is close to original, I might consider buying it and adding it, but I have no idea what an original one looks like. I like the Chevy Malibu emblem; not a bad solution. If I am able to get a new decal made up for the dash plate, I'd suspect that getting a couple more made at the same time wouldn't be any more expensive; let me know if you (or anyone else) would be interested in getting one. Thanks for the link to the control boxes. Mine is a slightly newer 60s vintage, but still the same basic operation. Nice and simple, it works just fine, I'm just hoping to make mine prettier. Brent, here is the hardware I have put together for my Malibu. They are not "Lone Star Specific" but are period correct. 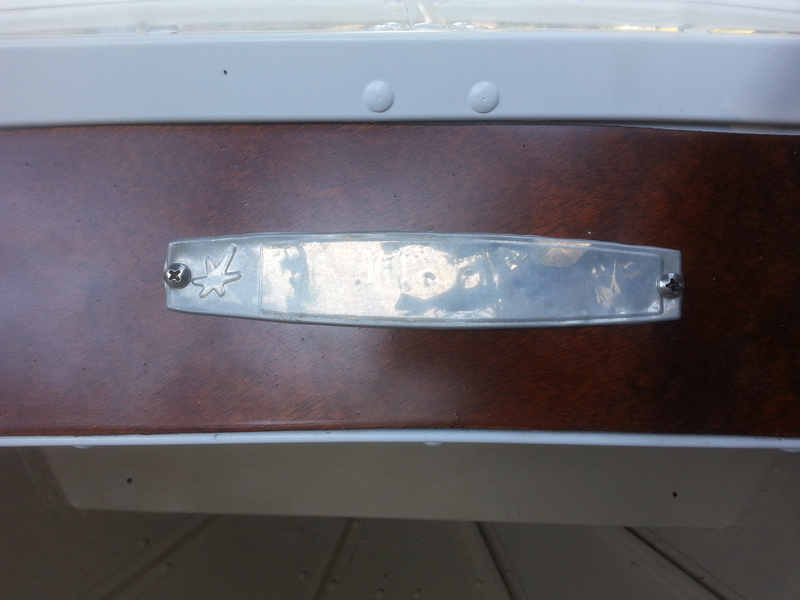 The bow navigation light will hold the Lone Star pennant on a wood pole. were the most common. Will be sending it all out for chrome soon. just to make it look nice and be a headturner. and the post will be removable and stored away when not in use. and it will have the polished aluminum flatbar down the center which will not be objectional (in my world). 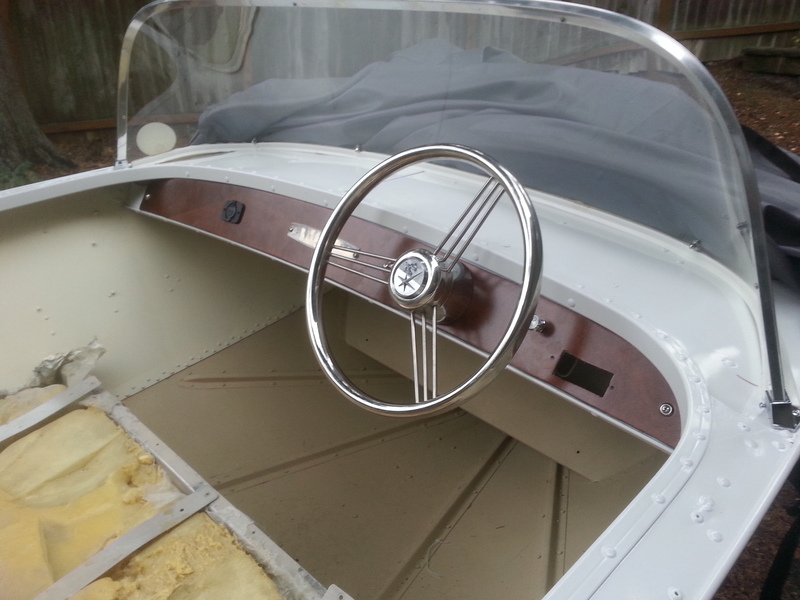 back to the vintage aluminum and wood boats. 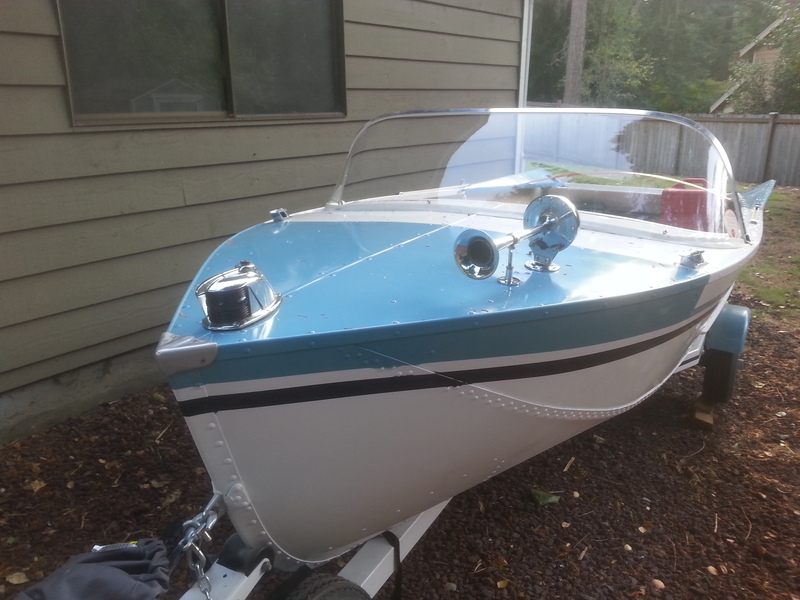 you mentioned the Cruisemaster..... they come up for sale now and then in my area. and renovation.......... so I will stick to 16ft and under. Thanks for the photos Johnny. I should say that I used the term "restoration" loosely; as I said in my first post, I was doing this on a budget. I want it to look original or at least period correct, but it's far from a true restoration. Similar to you, I'm hoping it will turn a few heads and be a unique runabout. The spotlight I have is a little too new and a little too tall/big; it tended to shake around a lot when I was trailering the boat. One about the size of yours would probably be about right. I look forward to seeing your progress. Yeah, the Cruisemaster is a good sized boat; I thought it would be cool around this area to maybe do weekend trips out to the San Juan Islands or fishing on the Sound. 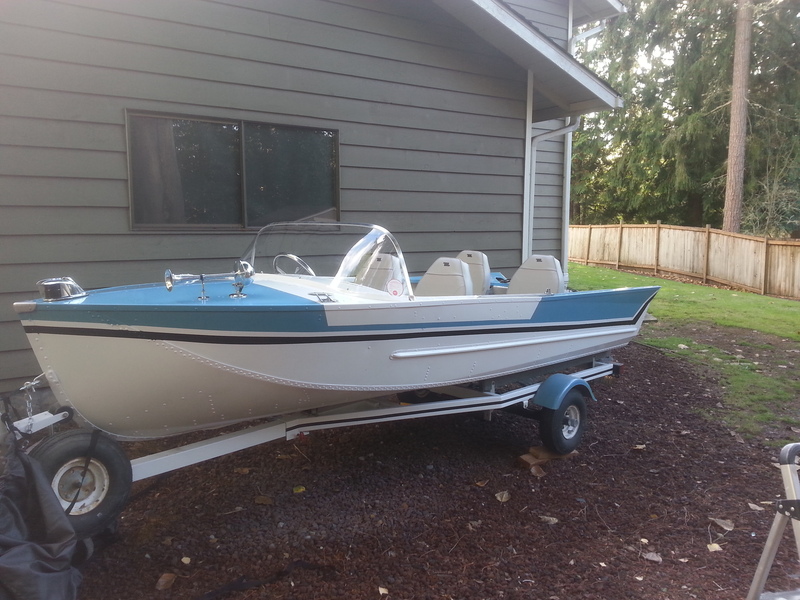 I'm kicking myself for not acting sooner; there was a nice original condition Cruisemaster (still had the original paint and no obvious modifications) with a 115-hp Mercury for sale near my parents for $700, but by the time I called it was already sold.